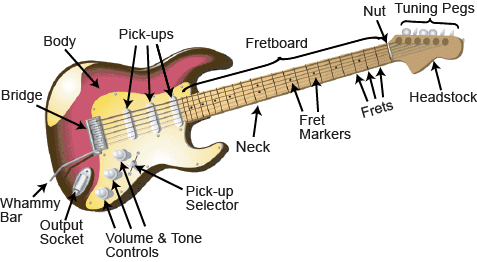 Need To Know The Parts of the Electric Guitar? An electric guitar is plugged into an amplifier in order to make the sound loud. The electronic pick-ups “pick up” the vibrations of the strings and convert them into an electronic signal, which is then sent to the output socket. Each pick-up sounds different because of its location on the guitar body. You use the pick-up selector to choose which pick-ups to turn on. The back pick-up sounds twangy and vibrant (good for lead guitar), while the front pick-up sounds full and rich (good for rhythm guitar). The body holds the pick-ups in place. The volume control knobs control the volume for each pick-up and the tone control knob controls the brightness of the sound. Some electric guitars have a whammy bar connected to a floating bridge to change the tension in the strings while playing. The neck and headstock on the electric guitar are basically the same as the acoustic guitar, however the tuning pegs on this electric guitar are all on one side.